A proper squat rack can cost as little as $60 and as much as $400 or more. To know how much you will need to spend on a squat rack depends on what you will be using the rack for. There’s a lot to consider when buying a squat rack, and price is just once of the things you need to consider. A $60 squat rack is a whole different piece of equipment than something that costs $400. There’s a lot of different types of squat racks or equipment that attempts to imitate a real squat rack. A “squat rack” can simply be a pair of free standing barbell holders. 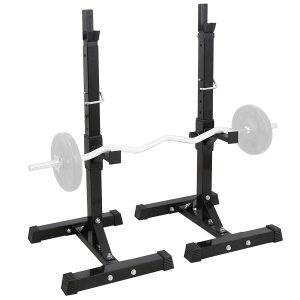 A “squat rack” can also be a full on power rack with a bench and ton of other accessories. Sow when you ask how much a squat rack costs, you need to know what piece of equipment you are actually talking about. Do you want something for squats only, or do you want a full home gym. How much weight will you be lifting? Cheaper squat racks cannot hold as much weight as full scale power racks. Do you want to do more than just squats on your equipment (like bench press)? How much weight will you lift? How much room do you have for the squat rack? Will you be lifting with a spotter or do you need a rack that will allow you to safely fail your lifts? Somewhere around $60 is the cheapest you can go for a quality piece of squatting equipment. If you want to cheap squat rack, get the F2C adjustable squat stand. This is great for beginners or those with very little room for their workout equipment. Because the squat stands are independent of one another, they are easy to move around and store wherever you have extra room. These stands can also easily be used for bench pressing. If you are looking to spend as little as possible, this is a good product. However, there are some downsides to getting two separate squat stands. These are never going to be as safe and reliable as connected squat stands or a squat rack. The two stands are independent, meaning there is always a chance that they will be positioned incorrectly relative to one another, or even worse, that one of them might fall over when you are attempting to rack your weights. This can be a dangerous situation. Placing these squat stands against a wall can help ensure that they do not get knocked over or shifted when they are in use, but it is still something to think about. This problem is especially likely for someone who is very tall or if lifting very heavy weights. Great for anyone with a tight budget. Great for anyone with limited space. Higher chance of squat stands shifting or falling over when racking weight. Maximum weight is only 390 lbs. Beginners or people with limited space. Buy it here. Next we come to a price range of around $115-$160. At this price range you get squat equipment that is connected. Usually there is a connector bar on the floor and also at the top of the two squat stands. This ensures that the squat stands are aligned correctly and will not shift away from one another. It also adds more stability, especially for taller lifters or when extra weight is applied. These types of squat racks are common at many cheaper gyms and can be great for multiple different exercises, not just squats. The top bar is great for pullups or assisted pullups. This type of squat stand takes up less room than a full power rack, but does take up more room than two unconnected squat stands. If you want to be able to squat in the comfort of your own home, and don’t think you will ever be squatting 300lbs or more, I would recommend getting this piece of equipment. The CAP Barbell Power Rack Exercise Stand is the most popular squat stands in this price range. Note that unlike a full power rack, there are no safety bars, to help you if you fail at a lift. Great for pullups, leg lifts, etc. Nothing to help you if you fail at a lift. If you are serious about weight lifting, you should invest in a full power rack. A power rack is stable, strong and will last a lifetime. This is a piece of equipment every weightlifting gym has, and every serious home gym should have. For something of decent quality you are going to be paying at least $400. If that seems expensive to you, think about how much you pay for a gym membership, and how long it will take for your own squat rack to pay for itself. Then think of all the time you will save not having to commute to the gym, not having to wait for someone else to finish using the gym equipment, and being able to work out whenever you feel like it. A power rack is the best investment a serious weight lifter can make. 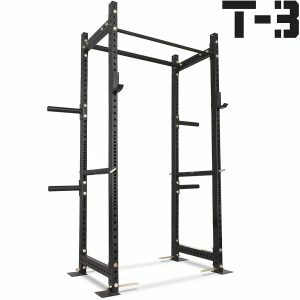 The Titan T-3 is a great power rack cage. It’s durable enough to take a beating and strong enough to hold over 1000lbs or weight. It’s going to provide the safety that cheaper squat racks do not have. It comes will pullup bars, J-hooks, and can be found in many commercial gyms across the country. You can feel safe working out in a squat cage like this because the safety bars will always catch and hold the barbell if you ever fail at a lift. The only drawback to this type of squat rack is the price and the large amount of space that it takes up. You can safely lift without a spotter. Can do many exercises, including dips, bench press, pullups, curls, etc. A squat cage takes up a lot of space. Anyone who is serious about weight lifting or power lifting. 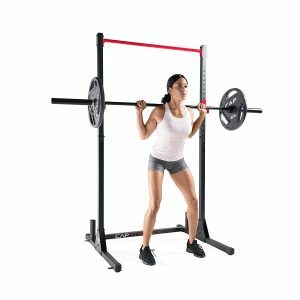 If this is a sport you plan on being a part of for many years, this type of squat rack will pay for itself in gym membership money saved and the time you save not having to deal with the gym. Buy it here. So How Much Does A Squat Rack Cost? It depends on what you want, but basically, anywhere between $60 and $400 or more.